The ability to download games, movies, TV and other media directly from the PlayStation Network to your PSP Go. 16GB of built-in flash memory for file storage and removable memory expansion via memory stick. Bluetooth support for skype headsets and other devices. Slide out control design to maximize the ultra-crisp 3.8" LCD screen functionality. No UMD design makes for a quieter, more energy efficient device. Introducing the smallest and mightiest PSP system yet. 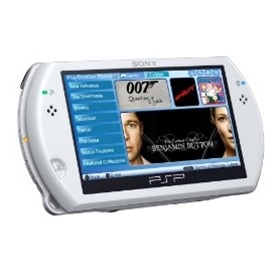 With the PSP Go users can download the best digital games and movies directly to the 16GB built-in memory and use built-in Bluetooth support to connect a wireless headset to more easily utilize Skype to talk with friends. But best of all, you can show off content via the new ultra-crisp 3.8-inch LCD screen, maximized by the PSP Go's new slide out control design. Go versatile, Go digital, Go anywhere. 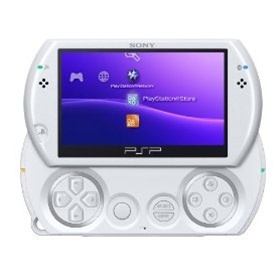 The PSP Go, has all the functionality that older PSP hardware versions had, but includes many important and exciting changes. Unlike previous versions whose primary means of playing media was via a built-in Universal Media Disc (UMD) drive, the PSP Go does away with UMDs altogether and instead relies on a media solution combining download functionality via Sony's PlayStation Network, larger onboard storage capacity and removable Memory Stick Duo support. This major change allows for a slim design, quicker access files and a much more quiet, energy efficient gaming experience since there are no longer any spinning UMDs. Other major changes include: Bluetooth support, allowing Internet Skype calls to now be made using compatible headsets; and more importantly, a change to the control scheme. The PSP Go features convenient slide out controls. Although these are consistent with historical PSP controls--featuring four directional arrows, the four familiar Sony face buttons and a left-oriented analog thumbstick--their ability to be placed out of view when not in use allows the PSP Go to maximize the use of its screen and your viewing pleasure. With the ability to play MP3, WAV, WMA, ATRAC3+, and MP4 files, you can easily use your PSP Go as an audio player. Simply place your music on a Memory Stick Duo, and you can navigate your collection using the PSP Go's XMB (XrossMediaBar) to select your song to play.